I contributed a recipe to the pool, and in return was granted the dubious privilege of making (courtesy of Silver Screen Suppers) a gelatin-based dish that was published in the Celebrity Cookbook. 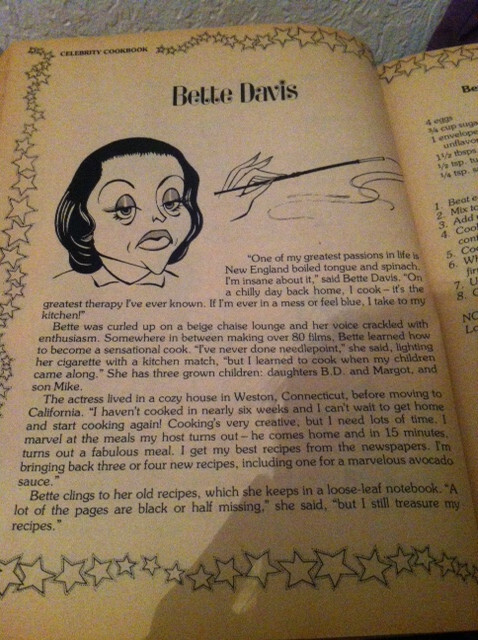 Turns out that Bette Davis shared her Mustard Gelatin Ring recipe. At which point I think I stared at the email for at least a minute, mind completely blank, unable to comprehend what the hell that was supposed to be. 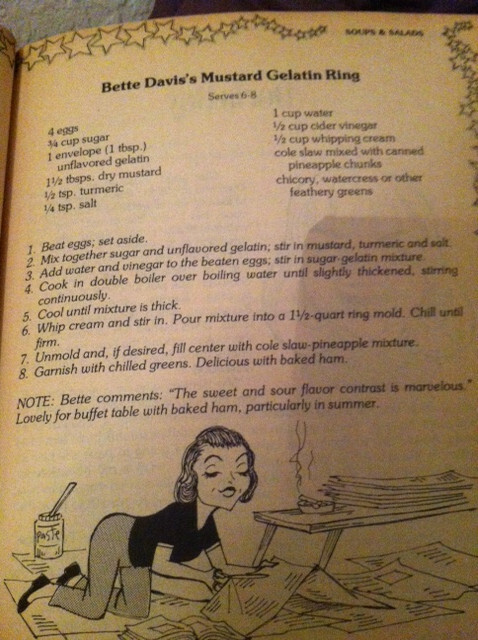 I have looked at this recipe many, many, many times as Bette is one of my favourite film stars and I’ve cooked many of her other favourite dishes (Finnan Haddie a la Davis, the lovely Brown Bette dessert, and her slow cooked Boston Baked Beans have all been devoured) but I’ve always BALKED at this one. What an earth IS a Mustard Gelatin Ring? What would it look like and more importantly, what would it TASTE like? I have absolutely no idea. I have absolutely no idea either. And I’m mildly terrified. 1. Beat eggs; set aside. 2. Mix together sugar and unflavored gelatin; stir in mustard, turmeric and salt. 3. Add water and vinegar to the beaten eggs; stir in sugar-gelatin mixture. 4. Cook in double boiler over boiling water until slightly thickened, stirring continuously. 5. Cool until mixture is thick. 6. Whip cream and stir in. Pour mixture into a 1-1/2-quart ring mold. Chill until firm. 7. Unmold and, if desired, fill center with cole slaw-pineapple mixture. 8. Garnish with chilled greens. Delicious with baked ham. NOTE: Bette comments: “The sweet and sour flavor contrast is marvelous.” Lovely for buffet table with baked ham, particularly in summer. This is a weird looking assortment, even for an aspic. There’s my Knox Gelatin, front and center! This is what I’d stepped away to do: adding spices to the sugar. Gelatin, quite a lot of mustard, and a bit of turmeric (presumably for color). It ends up looking sandy, and smelling intriguingly spicy. That all gets mixed in and stirred over a double boiler. As usual, the vague “until thickened” instruction isn’t particularly informative. After about 20 minutes of double boiler stirring, however, the mixture was definitely thickened. So we’ve made a sorta mustard zabaglione… with gelatin. After it had cooled down, but not completely solidified, we mixed in the whipped cream. It didn’t say to fold, but Buzz was still pretty gentle to avoid squooshing all the little cream air bubbles. The closest thing I have to a Jello mold is a bundt pan, so I’m rather glad we were assigned a ring-shaped recipe. But as a sort of sauce — cut a thin slice and put it on your nice warm ham steak, for example — this aspic works surprisingly well. The heat melts the gelatin slowly, and it turns into a wonderful gooey mustard sauce. The flavor is something like a rich honey mustard, with a hint of sweet-and-sour from the vinegar and sugar. This is a very clever presentation for a buffet, avoiding the typical risk of excessive dripping that might happen with a spooned sauce; also, the volume of sauce means there are a lot of servings here. This was fun… jiggly and weird fun, admittedly, but the Retro Recipe Attempts household is looking forward to the next recipe exchange! 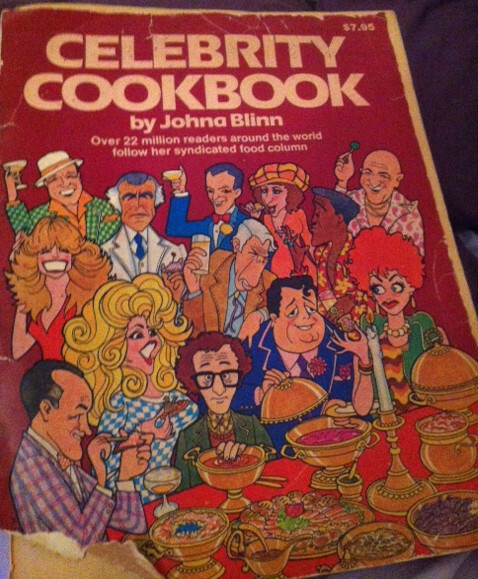 The recipe, originally from Bette Davis, was published in Celebrity Cookbook, Johna Blinn, Playmore Inc, Publishers, 1981. Photographs provided by Silver Screen Suppers. Oh fabulous! You did a brilliant job making Bette’s very odd recipe. I can ALMOST see how a chunk of it might be OK on a slice of ham but I’m going to have to take your word for it. Thanks for attempting this so that I don’t have to! I made something very similar to this–ok, almost exactly like this (but I called it Mustard Star)–and I really liked it. It does go well with ham! I’m glad that Ms. Davis did not disappoint! Omg. I can’t believe you pulled this off. I think you got the toughest one, girl. But you rocked it like a champ. Hats off! Bette would be proud. But the color is simply horrid, isn’t it? Oh my. I think that may count as a chemical weapon. Bravo! Making lemonaide out of grodie gelatin mold. I LOVE the repurposing and think that this is a GENIUS way to serve a sauce. Gravy at Thanksgiving? So much easier to PORTION OUT. Great job!! I don’t think I have ever seen all those ingredients used in a single recipe before! My grandmother used to make something called a “mustard plaster” which you’d rub on your chest to cure congestion. Maybe you could consider using this for the same thing. Or use it as paint. In any case, it explains why Bette Davis always looked pissed off. In olden days, the main course was a hunk of meat and boiled potatoes to feed the farmhands, or the big family. Biscuits, pickles, and side dishes like the mustard gelatin ring were served to alleviate the boredom, lol, at least that’s what I’m given to understand as to ‘why’ such a recipe exists. I could understand somebody (like my great grandmother) making this out on the ranch. However, that scenario doesn’t really seem consonant with Bette Davis’s background or circumstances.